Info "It’s dinnertime and I’m hungry! What’s the big idea with this spinning table?! I wanna eat!" Stick a Fork in It is one of Dribble and Spitz's Microgames in WarioWare: Smooth Moves. 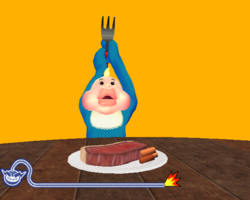 The objective is to stab the food by pushing the Wii Remote downwards, like the fork in the game. However, the table moves, so the player has to time it right. 1st level difficulty: The table moves slowly to grab a big steak. 2nd level difficulty: The table moves quickly to grab a piece of cake. 3rd level difficulty: The table moves very quickly to grab a small sushi. This page was last edited on February 20, 2018, at 15:51.